Mahindra India relaunched the new Mahindra Thar in Indian market.The new Mahindra Thar CRDe comes in two variants: Mahindra Thar CRDe 4X4 BS IV and Mahindra Thar DI BS III. 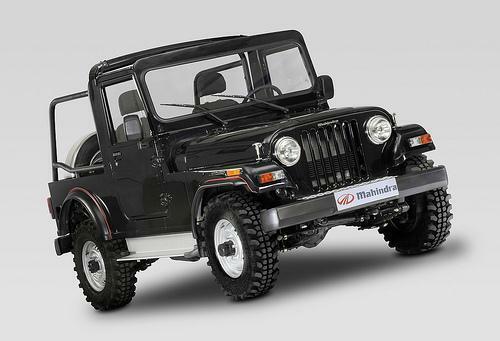 The standard price tag of Mahindra Thar is about 4.5 lakh. The new Mahindra Thar will hit Delhi, Chandigarh, Bangalore, Mangalore and Jaipur markets by end this month other markets by january 2011. New Mahindra Thar comes powered with a 2523cc, Turbo Diesel Engine providing a maximum power of 63 Bhp @ 3200 rpm and a peak torque of 180 Nm @ 1440 rpm.Mahindra Thar DI BS III model comes in both 2 and 4 wheel drive options. Tags:-Mahindra Thar launch, Mahindra Thar price, Mahindra Thar features, Mahindra Thar details, Mahindra Thar india price, Mahindra Thar india launch, Mahindra Thar specifications, Mahindra Thar features.